Biesman BS, O'Neil MP, Costner C. Rapid, high-fluence multi-pass Q-switched laser treatment of tattoos with a transparent perfluorodecalin-infused patch: A pilot study. Lasers Surg Med. 2015;47(8):613-8. Biesman BS, Costner C. Evaluation of a transparent perfluorodecalin-infused patch as an adjunct to laser-assisted tattoo removal: A pivotal trial. Lasers Surg Med. 2017;49(4):335-340. Reddy KK, Brauer JA, Anolik R, et al. Topical perfluorodecalin resolves immediate whitening reactions and allows rapid effective multiple pass treatment of tattoos. Lasers Surg Med. 2013;45:75-80. 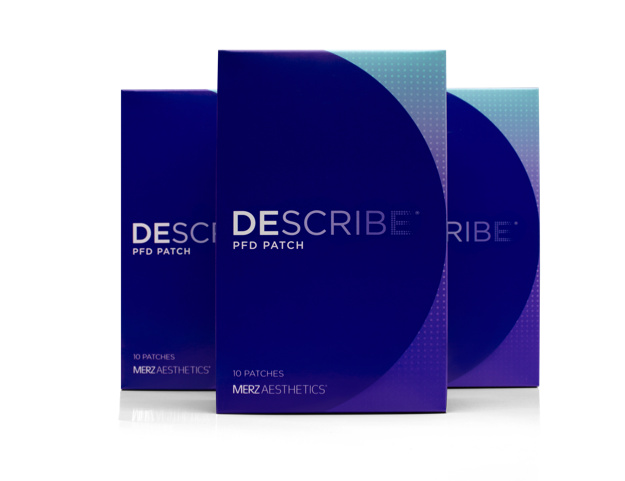 DESCRIBE® PFD Patch 510K clearance, K150212. ON Light Sciences, Inc. Dublin, CA. https://www.accessdata.fda.gov/cdrh_docs/pdf15/K150212.pdf. Published April 20, 2015. Accessed December 22, 2017.